Enhanced fluxes of solar energetic particles (SEP) — so-called SEP events — result from processes of explosive energy conversion in the corona, notably flares and coronal mass ejections. From Parker’s model of the interplanetary magnetic field, it is expected that particles accelerated in the corona reach the Earth, provided they are injected into interplanetary magnetic flux tubes near 50°—60° western longitude. Statistically speaking, SEP events conform to this expectation. But sometimes high-energy particles reach the Earth even though the parent active region is several tens of degrees away from the footpoint of the nominal Parker spiral. How can this be? Acceleration within a broad range of longitudes by a CME-driven shock is one possible interpretation. Another possibility is longitudinal transport along coronal magnetic fields within, say, 1 solar radius (R⊙) above the photosphere. But there is no investigation which demonstrates this and evaluates the range of longitudes over which the coronal magnetic field can carry energetic particles to the spacecraft-connected interplanetary magnetic field line. We undertook such a study in seven simple SEP events whose onset time was clearly defined, and where metric-to-kilometric type III radio bursts from electron beams were released together with the SEP (electrons and protons) detected in situ. We attempted to identify the coronal trajectory of the type III emitting electrons — which by inference is the trajectory of the SEP detected in situ — using two independent techniques: the tracing of field lines inferred from a potential (current-free) extrapolation of photospheric magnetic field measurements, and the mapping of type III radio sources in the solar corona at dm and m-wavelengths. Magnetic fields in the corona can be inferred from measurements of the photospheric magnetic field and a model of currents in the corona. The simplest model assumes that there are no distributed currents in the corona, except in a thin “source surface” of spherical shape, which is an interface between closed structures in the inner corona and radial open field lines in interplanetary space. Schrijver and DeRosa implemented such a model, using SoHO/MDI magnetic field measurements, a model of flux transport in the photosphere, and a hypothetical source surface at heliocentric distance 2.5 R⊙. This code is available in the idl-based SolarSoft data analysis package. Electron beams travelling through the solar corona excite Langmuir waves near the local electron plasma frequency. These Langmuir waves are converted into electromagnetic emission near the local electron plasma frequency or its harmonic. As the electron beams proceed from the low corona to the interplanetary space, they emit at a frequency which is the lower, the greater the height. Such emission is frequently observed from decimetric (hundreds of MHz) to kilometric wavelengths (tens of kHz), and is called a type III burst. Radio images at different frequencies can therefore provide cuts at different altitudes of coronal flux tubes which guide the radio-emitting electrons and, as inferred from the common timing, the solar energetic particles which are eventually detected near the Earth. We identified metric type III bursts using the radio spectrographs of the Potsdam Astrophysical Institute (Tremsdorf), the University of Athens (Thermopylae) and IZMIRAN (Troitsk, Moscow Region), and mapped their sources with the Nançay Radioheliograph. Figure 1 illustrates this: the type III radio sources at different frequencies align along open field lines inferred from the potential field model. The source height increases with decreasing frequency. The right panel shows the same magnetic field lines, but as they would appear to an observer above the Sun’s northern pole. The open field lines connect the flaring active region to the Parker spiral at the source surface. Its footpoint is at the tip of the red straight line. In this event the coronal magnetic field appears just as a connection to the Parker spiral, without any significant change in longitude. Figure 1. On the left: A comparison of type III burst sources at different frequencies (coloured contours) with the SoHO/MDI magnetogram and open magnetic field lines through the radio sources from Schrijver & DeRosa’s PFSS model. On the right: View onto the same open field lines from above the solar north. The footpoint of the nominal Parker spiral on the source surface is at the tip of the red line. 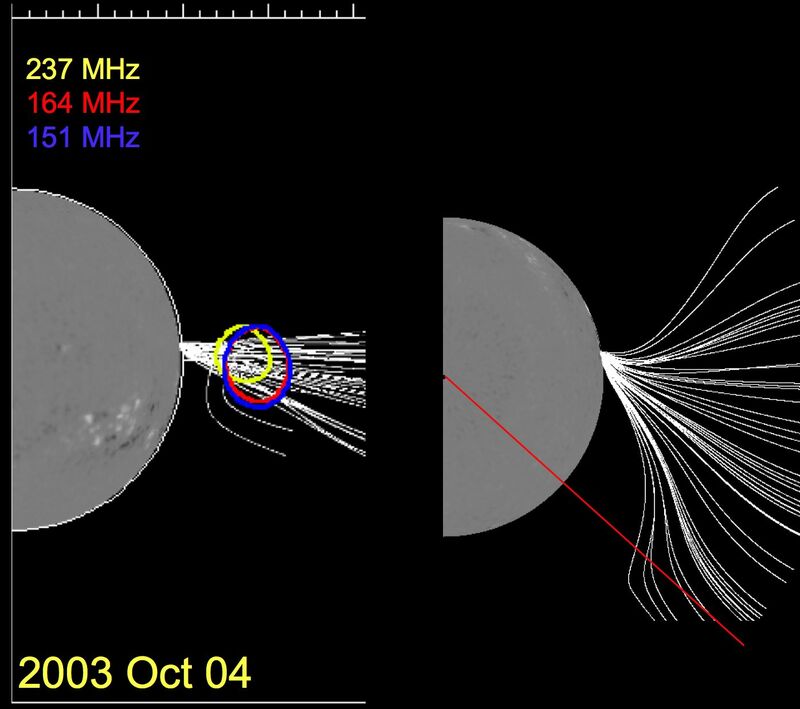 The situation is different for the 2003 October 4 SEP event (Figure 2): the flare occurs behind the western limb of the Sun, about 50° westward of the footpoint of the nominal Parker spiral. When looked upon from solar north (right panel), the open field lines pervading the type III source are seen to diverge rapidly with height. The easternmost field lines do intersect the nominal Parker spiral at the source surface. The type III sources confirm this result of the magnetic field extrapolation: the sources at different frequencies are close to each other, although the open flux tube is rooted close to the limb. If it were radial, the radio sources at 237 and 164 MHz would be farther apart than in Figure 1. The small distances in Figure 2 show that the sources nearly line up along the line of sight, as expected if they are located in an open flux tube which bends toward the observer, i.e., in this case toward the footpoint of the nominal Parker spiral. Figure 2. 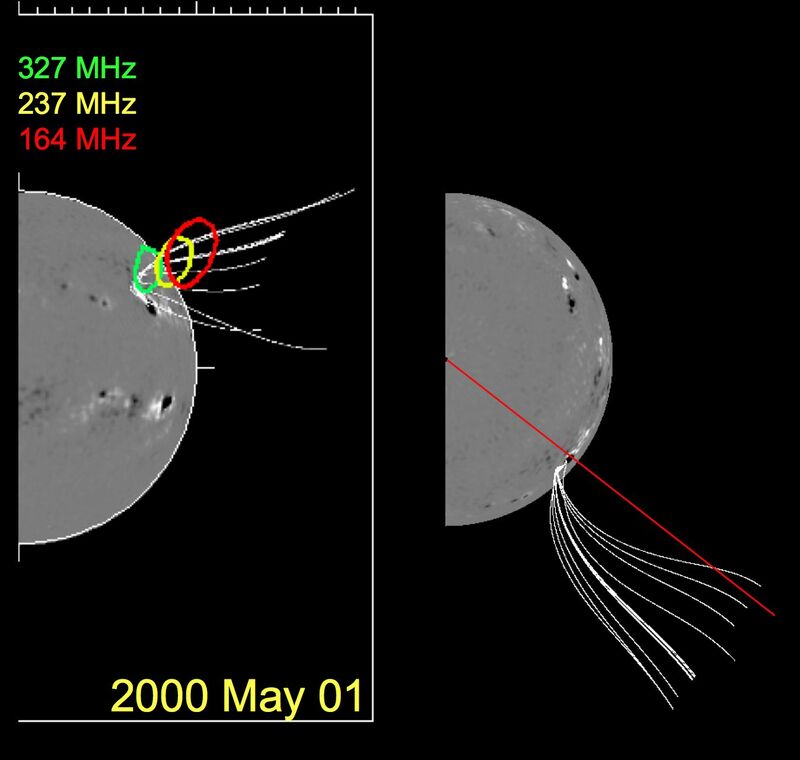 Radio sources, photospheric magnetograms and open field lines from their potential extrapolation for an SEP event related with a flare behind the solar limb. The observations demonstrate that open field lines rooted in active regions, which occupy a narrow range of longitudes in the photosphere and low corona, fan rapidly out with increasing height. This is because there are no closed loops at heights above 0.5 – 1.0 R⊙ which could confine the open structures, and is key to understand the transport of SEP and their magnetic connection to a given spacecraft. We studied 7 events. Their associated flares scatter around the nominal connection longitude of the Parker spiral, as is well known. The magnetic field extrapolations and radio maps show that extreme excursions, up to 50° in our sample, can be explained by the outward fanning of open magnetic field lines rooted in the parent active region. This does not mean that the entire longitude range of the open flux tubes at the source surface is filled with energetic particles during simple (impulsive) SEP events. Buttighoffer (1998) and Mazur et al. (2000) had shown that SEP at 1 AU fill flux tubes with typical longitudinal extent of 5×106 km, which corresponds to 2° on the source surface. This is a tiny fraction of the width of the flux tube in Figure 2. When extrapolated to the low corona using the expansion factors shown by the magnetic field extraplations, this size corresponds to magnetic structures as narrow as 1000 – 2000 km. The Parker model also assumes that the interplanetary magnetic field has no component perpendicular to the solar equator, so that particles accelerated at high solar latitudes would not be expected to be detectable in the ecliptic plane. The event of Figure 1 is an example which seems to be in conflict with this idea. But there is evidence both from magnetic field measurements and from the observation of Langmuir waves at the Wind spacecraft that the associated type III burst is emitted by electrons that are intercepted by the spacecraft in the ecliptic plane near 1 AU. The probable interpretation is that the interplanetary field line, which starts at high heliographic latitude, bends down to the ecliptic somewhere between the Sun and the Earth. This is consistent with earlier findings from the Ulysses spacecraft. These results have recently been published in Astronomy & Astrophysics Vol. 486, p. 589–596.